Once upon a time, I worked at Starbucks in a mall. It was a lot of frappucino slinging and getting people their caffeine fixes. For a caffeine-fueled student, it was a pretty decent situation. One of the things that people went nuts for–besides the PSL (seasonally) and the caramel sauce (all the timez)–were the seasonal pastries. The pumpkin cream cheese muffin was pretty popular–I mean, I get it! It’s a pumpkin muffin plus cream cheese middle. The math is solid. These orange and ginger muffins were inspired by that muffin but with more cream cheese filling, no pumpkin, a bit of ginger and orange zest, and some streusel for good measure. These muffins bake up tender and moist thanks to brown butter, molasses, and brown sugar. 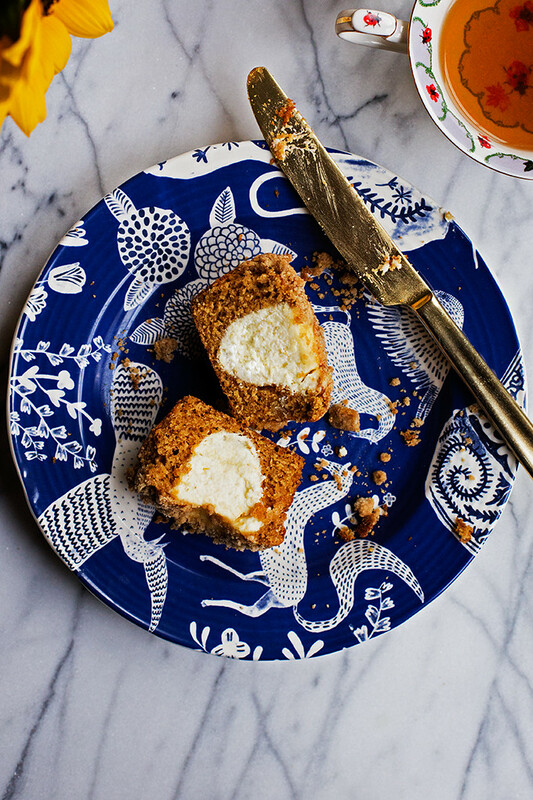 There’s orange zest in both the muffin batter and the cream cheese, so you get a little citrus-y zest in every bite. They aren’t super sweet, which I like in a muffin. It makes me feel more virtuous if I’m going to basically eat a cupcake for breakfast. 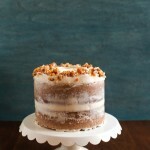 The streusel adds a little extra sweetness, though, so no worries. 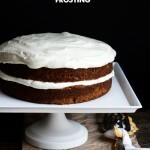 The cream cheese filling is creamy and bakes up kind of like cheesecake. 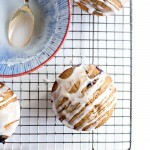 These muffins are seriously addictive. Evidence, I ate two yesterday before packing them up to send off to Sean’s co-workers. They come together pretty easily–though you do have to dirty a couple bowls, but I promise it’s worth it. 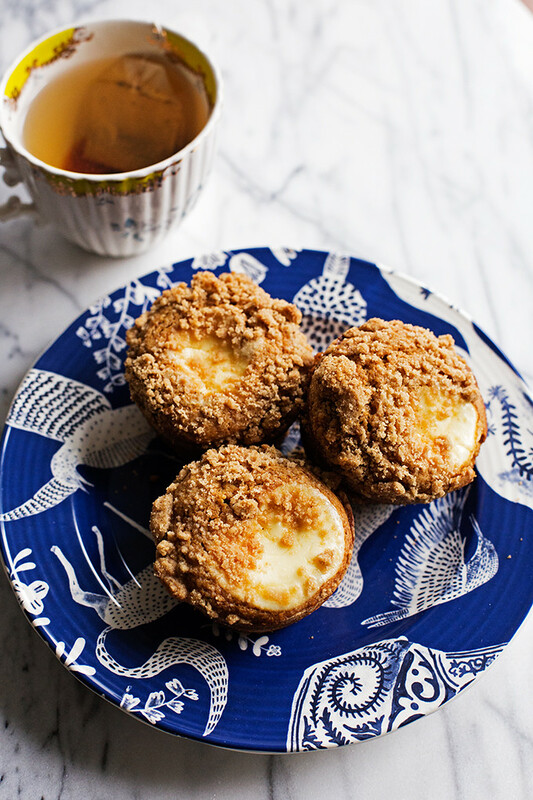 Tender orange and ginger spice muffins stuffed with cream cheese filling and sprinkled with streusel. Preheat the oven to 350°F. Spray a muffin tin with cooking spray or grease well. Make the streusel. In a medium bowl pinch the butter into the flour, sugar, cinnamon, and salt until it resembles coarse crumbs and just clump together. Set aside. Make the cream cheese filling. In a medium bowl beat the cream cheese with the vanilla sugar and orange zest unitl creamy. Beat in the egg until well mixed. Scrape the mixture into a piping bag (or zip-top bag) and set aside. Make the batter. Melt the butter in a skillet, stirring occasionally, until the bits in the bottom of the pan are browned and smell fragrant like toffee. Pour the butter into a dish to cool. In a large measuring cup whisk the milk, molasses, eggs, brown sugar, orange zest, fresh grated ginger, and vanilla together until well combined. In a large bowl whisk the flour, baking powder, ground ginger, cinnamon, and salt together to combine. 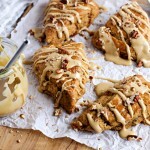 Fold in the milk mixture and the browned butter until just combined. Fold in the candied ginger. Divide the batter between the muffin tin molds, filling about ¾ full. Cut the tip off of the piping bag (or zip-top bag) and pipe a few tablespoons of the cream cheese filling into the center of each muffin. Sprinkle to tops of the muffins with streusel. Bake in the center of the oven for 22-25 minutes. If you don't have vanilla sugar for the cream cheese filling, use plain sugar and 1 teaspoon of vanilla extract. 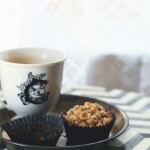 Adapted from these Hazelnut Streusel Apple Muffins. These look amazing. I’m really liking the ratio of cream cheese to muffin as well :) perfect winter baking right there. 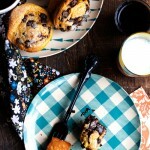 I love cream cheese stuffed muffins but these…THESE are super stuffed! Double stuffed, if you will and I am digging it hard. Yum! Yes!!! I have been sooooo looking forward to this recipe! I might have to make a few without filling for Andy. He just doesn’t appreciate the good things like frosting or filling. He is a strange kid hahaha! Omaagahhhhhh!!! That filling is killing me right now! Oh…the days of foodservice. I used to eat those seasonal pastries all the time (oh, and those chocolate-covered graham crackers)! 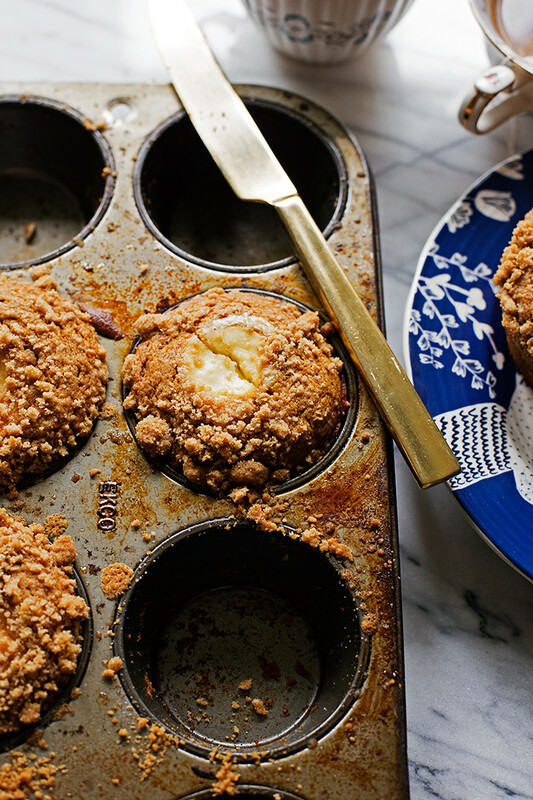 I looooove that hearty dose of cream cheese in the middle of these muffins and that crumb topping! OH GEEZZZ! I’m having a hard time accepting how gorgeous these are! Look so completely amazing!